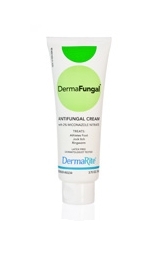 DermaFungal Antifungal Skin Protectant is an antifungal cream that aids in the treatment of athlete’s foot, ringworm, jock itch, and other superficial skin infections. It forms a moisture barrier on the skin. It also stops odor. DermaFungal Cream is 2% Miconazole Nitrate. It may be applied to skin folds to prevent fungal infections. It is a cost effective alternative to common pharmacy acquired treatments.